Environment and climate advocates, as well as members of grassroots communities welcome Pres. Rodrigo Duterte’s bold statements against rich, industrialized countries in their insufficient contributions to reducing emissions, leaving developing countries to bear the brunt of responding to climate change.SANLAKAS recognized that Pres. Duterte was raising legitimate points on the hypocrisy of rich, industrialized countries when it comes to combating climate change. Pedrosa noted that the burden of decreasing emissions must be borne primarily by developed countries like the US, the UK, and members of the European Union who are among the greatest contributors to the amount of greenhouse gas (GHG) concentration in the atmosphere. Last December 2015, in the gathering of countries in Paris for the Climate Convention, an aspirational target of 1.5 degrees was reached, a historical milestone after more than two decades of negotiation. “Most of the progressive pronouncements like the commitment to keep the global temperature under 1.5 degrees instead of 2 degrees was a call stemming from grassroots communities and social movements from the Philippines and developing countries.” Pedrosa asserts. Citizens of Yolanda-stricken areas, however, demand not just greater emission cuts from rich countries. “Not just emission cuts, but reparations,” is what Prof. Pascualito Ilagan, head of the Philippine Movement for Climate Justice – Easter Visayas Chapter, urged Pres. Duterte to demand from other countries. “Climate change and climate justice mean more than just preventing worse conditions and disasters in the future,” said Ilagan. “It also means obligating those most responsible for the climate change to pay loss and damages to us who have suffered the most from climate-induced catastrophes,” he added. Ilagan, who was among the ‘honest citizens’ honored by humanitarian relief organizations for returning wads of money they found immediately after the onslaught of Yolanda, clarified that the Philippines’ position as one of the most vulnerable countries to climate change does not excuse it from abandoning environmentally-destructive projects like fossil fuel and extractives/mining. Projects like coal and mining in Eastern Samar and Leyte have been resisted by communities. The Center for Energy, Ecology and Development (CEED), an independent research and policy advocacy institution for ecological concerns and people-centered development, reminded Pres. Duterte of his pronouncements to phase out coal and pursue renewable energy, despite his criticism of the Paris Climate Agreement. CEED Convenor Gerry Arances noted that in his dialogue with the Green Thumb Coalition, Duterte had responded positively to drastically reducing emissions and shifting to more sustainable renewable energy resources. 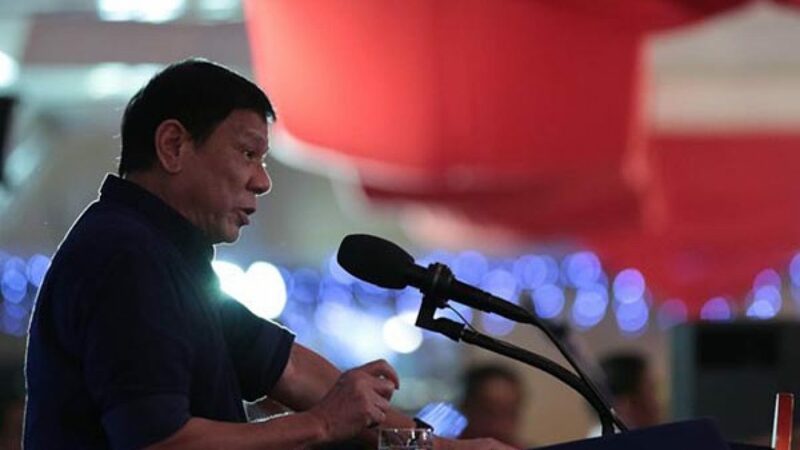 “The Duterte Administration agrees with the eventual phase out of coal power plants and other plants that use harmful fuels and steer the country for more investments in RE,” the then-presidentiable Duterte said. Arances emphasized that in spite of Duterte’s bold statements against the Paris Declaration, positive developments are gradually unfolding under his administration, including the ongoing Energy Review of proposed and existing coal-fired power plants in the country, and the audit of mining operations across the country spearheaded by Duterte’s DENR Secretary Gina Lopez. “Rather than follow in the footsteps of climate-hypocrites, we must walk our talk in terms of our contribution to combat climate change while pursuing our need for a more sustainable, cleaner and people-centered development path,” Arances concluded.